Canon Patrick Comerford, during a special presentation, highlights the social cohesion work undertaken by the Rathkeale group of parishes (Editorial, page 2). 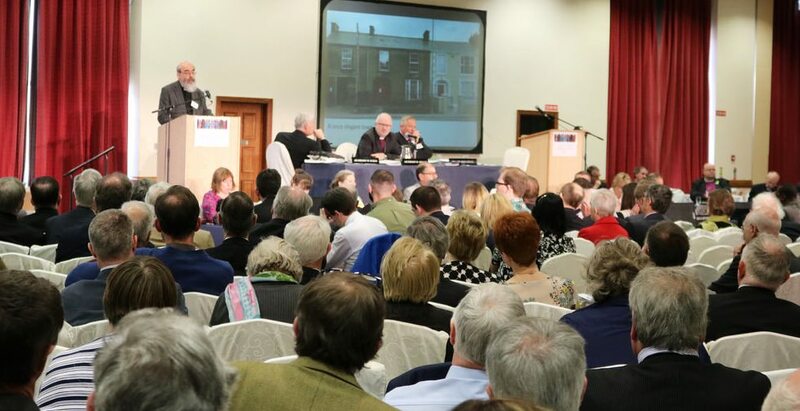 As always, the General Synod last week was a time for the bishops, clergy and laity of the Church of Ireland to come together to deliberate for the good of the Church. The venue – the South Court Hotel in Limerick – provided suitable accommodation for the large gathering and it was surely a welcome change for all concerned to have the opportunity of visiting Limerick and of learning about the diocese, experiencing worship its cathedral and hearing about its wider ministry. The Dean of Killaloe, the Very Revd Gary Paulsen’s leading of the daily devotions in the Synod hall was much appreciated. In connection with the diocese’s wider ministry, it was instructive for the General Synod, in an informal session, to hear a presentation from Canon Patrick Comerford and David Breen on ‘Celebrating our Communities: tension and cohesion in Rathkeale’. During the presentation, the Synod heard of a special focus of the local parish’s ministry in the ecumenical Rathkeale Pre-Social Cohesion Group’s outreach to the travelling community, which comprises at least one- third of the population of the town. It is an exemplary ministry of concern for a marginalized section of Irish society.